Manchester Country Club (MCC), one of New Hampshire’s premier private clubs and recent Association of Golf Merchandisers Platinum Award winner, has named Jefferson May, PGA, as the Club’s new Director of Golf after a nationwide search to fill the leadership roles in the club’s Golf Department. Brian Moskevich, PGA was concurrently promoted to Head Golf Professional, serving under May to operate the club’s entire golf operation. A BoardRoom magazine Distinguished Club and this year’s host to the New England PGA Championship, Manchester Country Club has employed fewer than ten golf professionals (including May and Moskevich) in its entire almost-100-year history. Prior to May’s appointment at MCC, he served at The Muttontown Club in Long Island, N.Y., where he oversaw and managed the entire golf operation as their Director of Golf. May also worked under legendary Golf Professional Rick Meskell for five years at Meadow Brook Country Club on Long Island and spent his winters as a full-time instructor at the John Ondrush Golf and Fitness Academy. 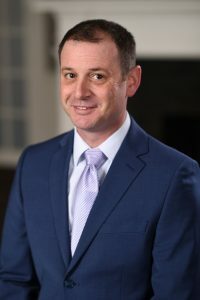 May has held positions at Timber Point Golf Course, Tam O’Shanter Country Club, Bear Lakes Country Club and nationally recognized Sands Point Golf Club, where he holds the course record. A graduate of Marist College in Poughkeepsie, N.Y., May received an athletic scholarship for their baseball team, played in three NCAA tournaments and signed with the Houston Astros professional baseball organization before embarking on his golf career. May relocated to N.H. this year with his wife, Jennifer, and two children, Camryn and Ryan. As the new Head Golf Professional, Brian Moskevich will be supporting May in the overall operation of all golf-related responsibilities at MCC. Moskevich attended North Carolina State University, where he earned his bachelor’s degree in Parks, Recreation and Tourism Management with a concentration in Professional Golf Management. He also earned his PGA Class A Membership while there. A successful amateur- and collegiate-level player, Brian has worked at MCC for the last five years, with prior experience at The Honors Course in Chattanooga, Tenn. and the Pinehurst Resort in Pinehurst, N.C.
Manchester Country Club (MCC) is a private, member-owned club committed to a tradition of superior hospitality, amenities and playing surfaces. Its historic par 71, 18-hole golf course was originally designed by Donald Ross and built in 1923. Also a premier wedding and event venue, MCC has been providing event space and services to the community (members and non-members alike) for almost 100 years. Manchester Country Club is managed by Troon Privé, the private club division of Troon, the world’s largest golf management company headquartered in Scottsdale, Ariz. For more information, please visit manchestercountryclub.com.